Have you ever found yourself so far behind the times that you wound up on the cutting edge? They say time is an eternally recurring loop. 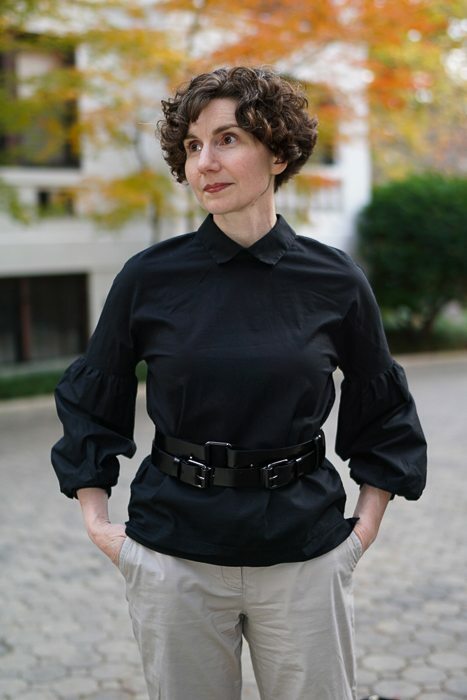 I bought this lantern sleeved blouse last winter from YOOX, which means that it was probably sold at retail before 2015, and yet it seems to be au courant. 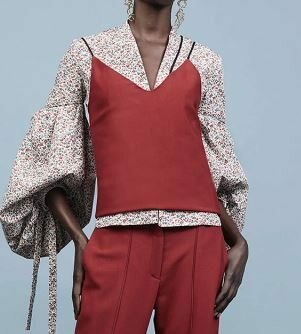 This season (SS2017) everyone is showing blouses with enormous, blooming sleeves. I suppose it is possible that this purchase was not behind the times, but rather on the cutting edge. The shape strikes me as neo-Edwardian, but I haven’t seen the term applied by any fashion editor. The Edwardian period — derived from a reign of only 9 years — had an early period and a late period. Leg o’mutton sleeves (what a horrible name) were popular in the late period, but the shape was inverted (full over the forearm and then cuffed at the wrist) during the early years. You may remember that this blouse is very boxy. But it recently occurred to me that the blouse might look better if it had a little shape. 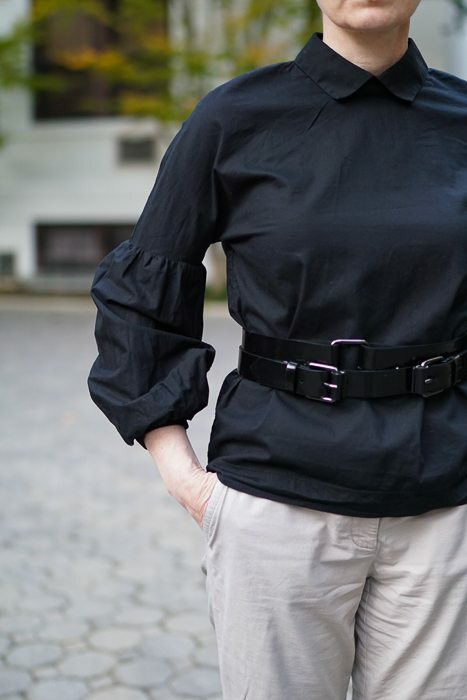 I was planning on bringing it to Fatima so that she could add some darts or other clever contouring with seams and then I had another idea: I could simply belt it. And I have just the belt for the job: the kick-a$$ belt. If you’ve seen the movie Soapdish, you may remember a network executive (played by Garry Marshall) chastizing one of his producers for running a storyline that was depressing and expensive. He said, You know the words I like? I like the word “peppy” and the word “cheap.” Peppy and cheap. I, too, like peppy and cheap. This is a peppy and cheap fix. In fact, the belt becomes cheaper (cost per wear) every time I wear it. 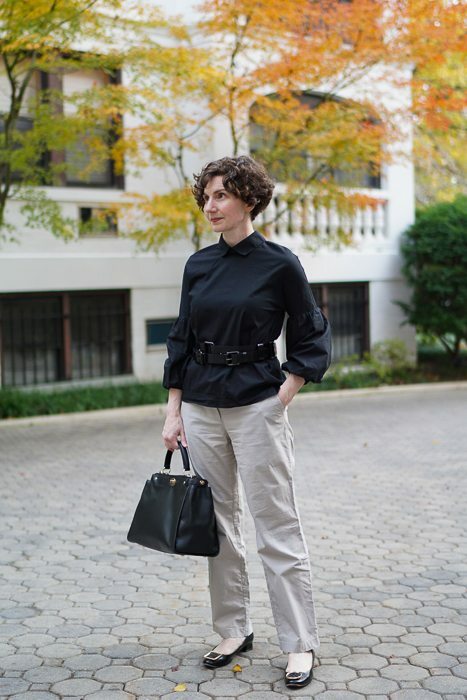 See the belt lend its expertise and panache to these outfits: Back, in Black, Working in Pajamas, and A Work of Art. And on another note: The Photographer and I went to the Women’s March on Washington and were astonished and thrilled by the energy in the air. The protestors and lawyers working at the country’s international airports this weekend have blown me away. This is America. The Soapdish reference made my day!! 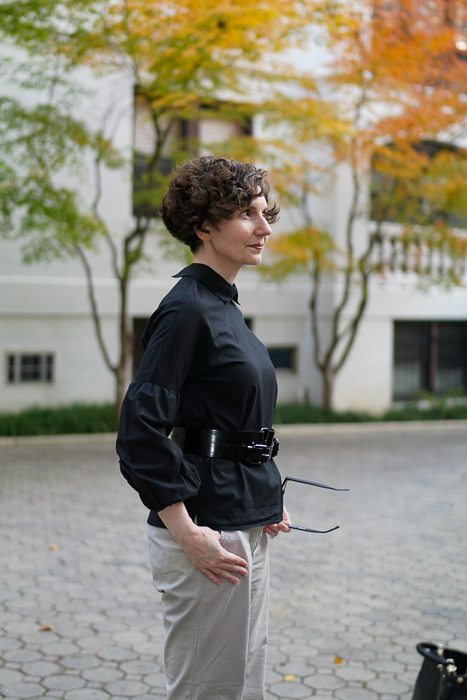 And, of course, the beautiful blouse, belt, and great writing. Thank you, Directrice. Well first, great look. Then second, did you know all that Edwardian info off the top of your head or did you have to look it up? Because third, I was thinking that the look is a tad militaristic, and that made me think of the Black and Tans, which I then did look up just to double check (remember I majored in art history, not “real” history), and now I rescind that comparison. So let’s just stick with the first. Also, I always appreciate the re-purposing entries – very helpful and inspiring. As the beneficiary of a liberal arts education, I have a lot of random knowledge stuffed in my head. But I am not an authority on anything. So, I knew the years of King Edward VII’s reign and the general look of the period, but had to confirm the specifics with some quick-and-dirty Internet research. Also had a vague sense of the Black and Tans, but did not realize the full extent of their infamy until . . . more Internet research. I think it’s safe to say that if you are known for “reprisals” you are infamous, no? 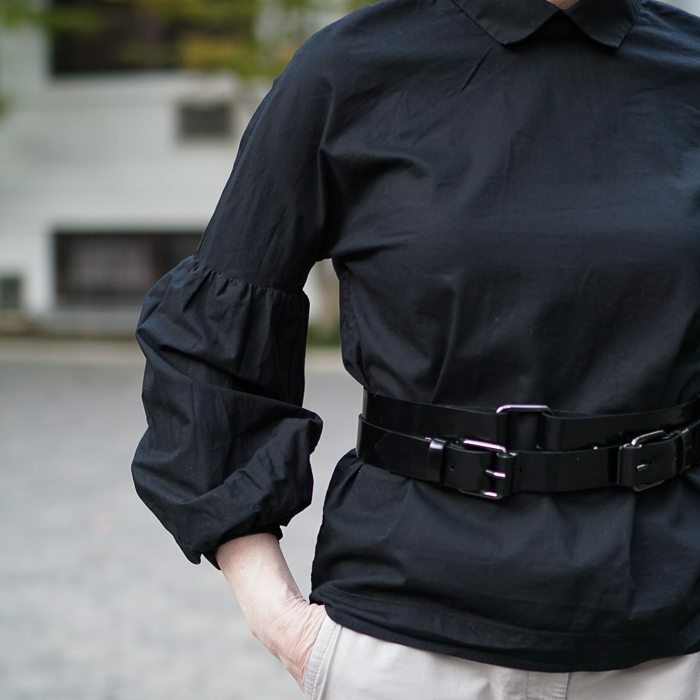 I love the sleeves, and I love the blouse belted. I’m so happy you went to the March! Thank you. Love the blouse. Love the combination. Love you. Love the sleeves too but inquiring minds want to know if you’ve got a good tip to avoid crushing their magnificence when you put on a coat or jacket ? I do not have a good tip for that! A colleague of mine, from the South, told me that all of her bridesmaid dresses (and she had several) had sleeves that were “puffed and stuffed” — so there is precedent for using tulle to provide structure inside a balloon sleeve, but I think it would be very uncomfortable. Hi Directrice, I hope you run for office some day, preferably soon. I wouldn’t be able to vote for you, but at least seeing you do it would give me some hope for the human race. No need to approve this, I just wanted to say it.